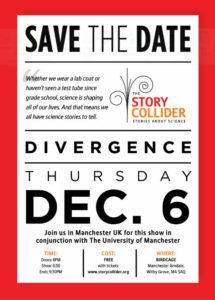 The Story Collider is delighted to be partnering with The University of Manchester to hold a science storytelling show at The Birdcage on 6th December 2018. For this show, we’re seeking true, personal stories about science to be told live on stage. These must be stories with a beginning, middle, and end, not lectures or speeches, and they must be true, first-hand experiences. 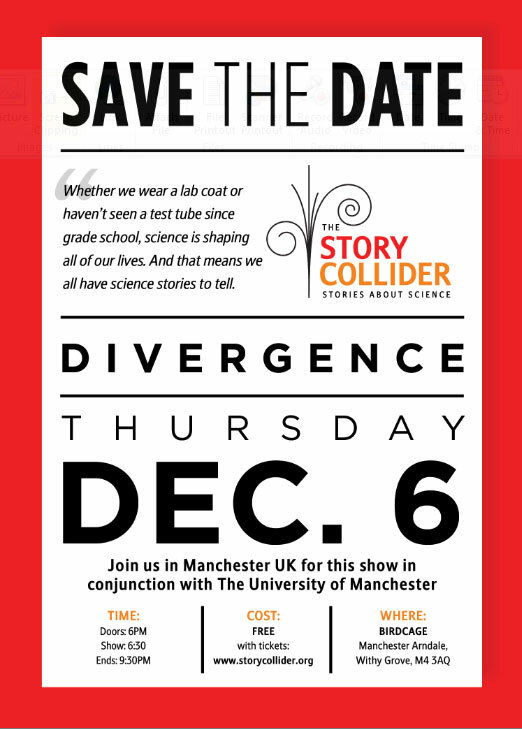 If you’re interested in sharing your story at the show, please email us at stories@storycollider.org by 6th November and include a short (1-2 paragraphs) summary of your story and “Manchester” in the subject line. Don’t worry if your idea is not fully developed yet – our producers will work closely with you to develop it in the weeks leading up to the show. So please send us your ideas! If we think your story might be a good fit for the show, we’ll confirm with you before November 15. This entry was posted in Uncategorized and tagged public engagement, science communication, storytelling by Dee-Ann Johnson. Bookmark the permalink.